I am currently listing all the Personal Papers of Brian Houghton Hodgson ready for their entry on Archives Hub. The material has been partly catalogued before and I am keeping approximately to the order that was established previously but have already discovered some more correspondence that has needed to be slotted in amongst those already listed. This week I finished listing the correspondence – over 400 items, 200 of which are contained in an autograph book compiled by his second wife, Susan. Brian Houghton Hodgson must have been a man of innate curiosity. Throughout his time both in Nepal and Darjeeling he was finding out and recording on subjects as far ranging as architecture and ethnography; zoology and Buddhism; botany, languages and education. Some of this activity would be due to the official nature of his posting, but his research went far beyond what would have been expected. And not only was he a researcher, but he was also a collector and generous donor to institutions throughout Europe. Still waiting for me to sort, are some lists concerning some of his donations. The Royal Asiatic Society benefited from Hodgson’s generosity. We still have many manuscripts and artworks that Hodgson donated. 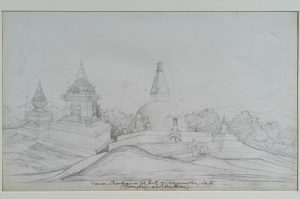 Chaityas at Svayambunath, Kathmandu by Raj Man Singh, 1844. Part of Hodgson Collection. In 2004 the RAS with Routledge Curzon published “The Origins of Himalayan Studies: Brian Houghton Hodgson in Nepal and Darjeeling, 1820-1858”, edited by David M. Waterhouse – a fascinating book in which different experts describe how Hodgson influenced and provided some of the foundations in their area of expertise through the research he undertook, the papers he published, and the specimens and other donations he provided. But as the title suggests, the period covered is just that time when Hodgson was in Nepal and India. In 1858, Hodgson returned to England, preceded by his first wife, Annie, in 1857. They first settled in Dursley, Gloucestershire and then in 1867 moved to Alderley where he was based until his death. Annie died in 1868 but Hodgson remarried in 1869. Susan was just 26 years old but according to the biography by David Waterhouse, their marriage was a happy one. But it seems, you could take the man out of Nepal, but you couldn’t take a love and interest for Nepal out of the man. This week, I have listed some letters from 1873. Hodgson, a man in his seventies, was certainly not living the life of a retired pensioner. The letters reveal that he was greatly concerned about commerce in Nepal, Tibet and Sikkim, and about the Russians entering the Indian subcontinent through China. Now Hodgson, a man of his era, firmly believed that the English should be exploring and settling in these countries but he was also a proponent for working with the countries’ leaders, rather than subduing them, and for education of the population in their vernacular languages. 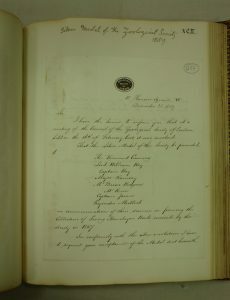 In 1873, the Society for the Encouragement of Arts, Manufactures and Commerce decided that they would send a deputation to the Duke of Argyll (who Hodgson consistently misspells as the Duke of Argyle). George Campbell, the 8th Duke of Argyll, had been appointed as Secretary of State for India in Gladstone’s Government of 1868. Hodgson was keen to join the deputation and write a paper to present to the Duke. 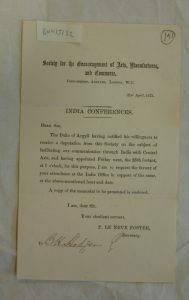 So in the archive there is a letter from P. Le Neve Foster, Secretary of Society for the Encouragement of Arts, Manufactures and Commerce to Brian Houghton Hodgson to inform him that the Duke of Argyll has notified his willingness to receive a deputation from the Society and to request Hodgson’s attendance at the India Office for this purpose. 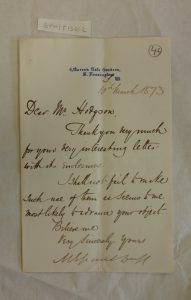 There is also correspondence between Hodgson and Colonel Hardy concerning the wording of the paper that Hodgson wants printed to go to the Duke of Argyll. 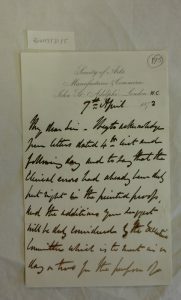 Letter from Colonel Hardy to acknowledge Hodgson’s letters and to assure him that the clerical errors had already been corrected in the printed proofs and that the additions Hodgson suggests will be considered by the Executive Committee, dated 7 April 1873. But Hodgson wasn’t satisfied with just going through the official routes. He was writing to anyone and everyone who he thought might have some influence in the situation or had the ear of somebody of influence. Thus there are letters to Sir Rutherford Alcock, former Counsel-General in Japan; Sir Louis Mallet, then Member of the Council of India and advocate of free trade with the Indian state; Frederic J. Mouat, Inspector of the Local Board and Member of the Statistical Society; M.E. Grant Duff, the Under-Secretary of State for India; Charles Gridlestone, Officiating Junior Under Secretary to the Government of India; W.W. Hunter, Statistical Surveyor of India; Thomas George Montgomerie, Surveyor, Great Trigonometric Survey of the Indian sub-continent; and others. In all this correspondence Hodgson shows his concern regarding British commerce with Nepal and Tibet and pushes for the Governor-General to open negotiations with the Nepal and Tibetan leaders, and for the British to be concerned regarding Russia attacking the N W Frontier. Letter from M.E. 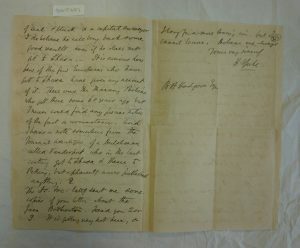 Grant Duff to Brian Houghton Hodgson to thank Hodgson for his letter and enclosures and that he will use them to advance Hodgson’s cause, dated 10 March 1873. 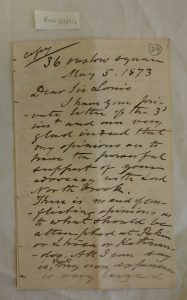 This letter was written before Sir Clements Markham published Narratives of the mission of George Bogle to Tibet, and of the journey of Thomas Manning to Lhasa in 1876, so it was interesting to read that Manning’s journey was known about and being written about some years after his death in 1840. The listing of the letters has not only enabled me to discover more about Brian Houghton Hodgson but also something of the political history of that period. As I move on to listing his papers and notes, I look forward to learning more about the subjects to which he devoted so much of his life.